You may think of kiwifruit as green, but in the wild they are found in red and yellow as well. In the late 1970s, New Zealand kiwifruit growers began experimenting with the breeding of a golden kiwifruit (in the U.S., we call it “kiwi” for short). 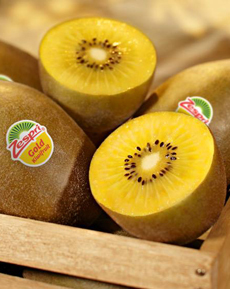 In 1992, Zespri—the world leader in premium quality kiwifruit—selected one offspring plant from the breeding stock to create the the golden-fleshed berry* now known as Zespri© SunGold© Kiwifruit. It is available at supermarkets nationwide from May through October. SunGold is sweeter than a green kiwi, and tastes like a cross between a mango and a strawberry with just a hint of tanginess. We adore it. NOTE that SunGold is a proprietary strain from Zespri. You may find other golden kiwifruit; we can’t vouch for it. Look for the Zespri label. Like regular kiwi, SunGold offers healthy ammounts of vitamins C and E, potassium. Its sunny yellow sweetness boosts the nutrition and color on the plate. Golden kiwi is usually ready to eat when you buy it. It should feel slightly soft to the touch, like a ripe peach. Once ripe, it should be stored in the refrigerator (the same for green kiwi). Green kiwi may be a bit firm when you buy it, and will usually ripen at in three to five days at room temperature. The firmer the fruit, the more tart it will taste. SunGold kiwifruit have a smooth skin, not fuzzy like green kiwi. 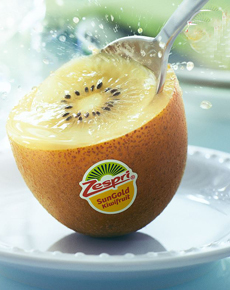 All you need is a spoon (photos courtesy Zespri). To speed up the ripening process, place kiwis (or any fruit) in a closed paper bag on the counter along with an apple or banana. Fruits like apples and bananas produce natural ethylene gas, which accelerates ripening. By the same token, any ripe fruit should be stored away from ethylene-producing fruits—never in the same produce drawer. If you want to store the fruit for longer than a few days, keep it in a plastic bag in the fridge. *Yes, kiwi is a very large berry. It grows on a vine. 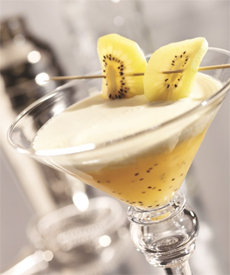 Kiwi-banana cocktail. 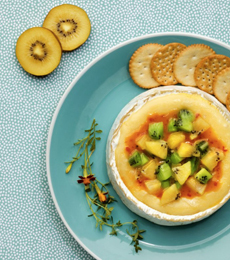 Baked Brie with kiwi compote (photos courtesy Zespri). 1. MUDDLE the kiwi and rum in a shaker. Add the Bärenjäger and shake with ice. Strain into a Martini glass. 2. PLACE the cream and Liquor 43 in a shaker. Shake for 30 seconds until frothy. 3. PLACE a teaspoon (flatware) against the inside edge of a Martini glass, with the well facing the glass. Slowly pour the cream mixture over back of spoon onto the kiwi mixture, creating a layered effect. Garnish as desired and serve immediately. †A serrated peeler works best for peeling kiwifruit. ‡You can substitute another honey liqueur and can also easily make your own honey liqueur. **Licor 43 is made from citrus and other fruit juices, flavored with vanilla, herbs and spices. You can substitute another vanilla liqueur or a citrus liqueur. Prep time is 10 minutes, total time is 25 minutes. 2. STIR together in a microwavable bowl the jelly, mustard and pepper. Fold in the kiwi and microwave on high power for 1-1/2 minutes, stirring halfway through heating, until hot. 3. TRANSFER the Brie to a serving plate. Top with the kiwi compote and serve with crackers or breads.